We began the weekend with an ambitious plan to start from Cone Saddle, and walk to Alpha Hut during Saturday via Neill, Winchcombe and Hector. It didn’t quite work out, but we still had a good time. south from near Neill Peak (1158). 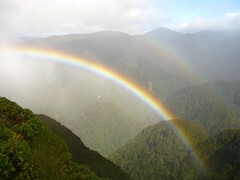 Location: Tararua Forest Park, Walls Whare Road-end. People: Alistair, Sarah, Illona, Amanda, Bernie and me. Huts visited: Cone Hut (1 night). Intended Route: Walk to Cone Saddle and camp on Friday night. From Saturday morning head up to Cone, over to Neill via Neill Saddle, across to Winchcombe Peak, continue to Hector, then follow the Southern Crossing track to Alpha Hut for Saturday night. Out via Marchant Ridge on Sunday. Actual Route: We got to about point 1055 below Winchcombe Peak, then decided to turn around and head back to Cone Hut for the night and head back to Walls Whare on Sunday. We arrived at Walls Whare in coordination with another club group that was indirectly aiming for Totara Flats, with both groups planning to walk the first leg of their trip on Friday night. The others intended to spend the night at Cone Hut, whereas we thought we might just camp up the hill at Cone Saddle, which was marginally closer to where we planned to go. The track was very muddy all the way up to Cone Saddle, and for a while we suspected we might not actually be able to find a flat area that wasn’t a bog to set up our Huntech flies. After a while we began to spot the occasional flat area several metres off the track, however, which was reassuring. At Cone Saddle we set up one fly slightly off the track, and another in the middle of the track, where it looked deformed once it was set up thanks to a bit tree-stump… otherwise it was very comfortable. Huntech says these flies are for 2 people, but with some ingenuity it’s nearly always possible to get 3 people under them, and we easily had 3 under both. It began to get light around 6am, but with the fly still fairly damp and very light rain outside, we were a little reluctant to get up. From 10 metres away in the other fly, we heard Alister’s voice state something along the lines of how he’d be going at 7 with or without us, but it wasn’t until after some morning wake-up brews from within sleeping bags that anyone really began to stir properly. 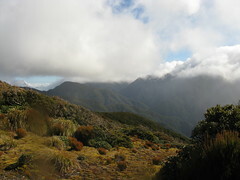 Thus it wasn’t really until about 7.15am that we actually got going, heading north up the track to Cone Peak (1080). Within 10 minutes we heard the screech of at least one Kaka, and turned around to see it fluttering away in the tree-tops above us, which I thought was quite a neat thing because although small numbers of Kaka are known to live in the Tararuas, it’s the first time I’ve ever had the pleasure of actually seeing one there in the wild. Being under trees, the water was transformed from a light, misty rain to some more focussed drop-lets dripping from the branches, which is a nice setting to be walking through in the goblin forest up towards Cone. Before long we were starting to get damp, however, and some of us found raincoats. The occasional windows through the trees that looked off the spur towards the west let us see through to some increasingly impressive rainbows. We still needed water for the day (even though Alistair had pointed out we’d walked past several obvious mud puddles on the way up), and the most obvious source was around Cone Peak, which has the odd tarn. We reached Cone a bit after 8.30’ish, and stopped just inside the tree-line because Amanda pointed out that it was likely to be much colder outside than it was under the trees. There was a last slab of snow nearby in the trees. She was completely right, too, and a moment after I stepped out for the 100 metre walk towards the tarn, I was glad I had my raincoat to fend off the wind, and wishing I’d bothered with my balaclava. The route turns from north to east at Cone, and to get to the tarn for water, we’d strayed some distance from the main route towards Neill (leaving most gear back under the trees). Consequently, we were only exposed on Cone for a minute with the exception of the dash for water. just west of Cone Peak. We left Cone at about 9am, and 10 minutes later we reached the cairn which marks where the marked route swings from west back to north, as it dips into Neill Saddle. From here the route dips into some more very nice goblin forest, which is quite steep in places but still very pretty. We also passed the odd pool of water which might also have been good for collecting water if we hadn’t already filled up so recently. We arrived at Neill Peak (1158) at about 10.30am, and for a few minutes we had more exposed tops to traverse, which was okay for as long as it was possible to keep the freezing wind off. 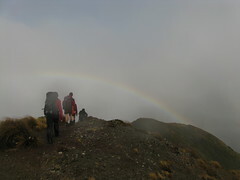 There was still a very light misty rain, and consequently we were following rainbows for much of the time. Getting down from Neill was fairly steep and muddy in places, but easily do-able with care. By 11am we were in trees again, heading towards point 1055. It was about now that things changed. After 4 hours of walking we were only a third of the distance we’d planned to travel for the day. Nobody was knackered, but although we expected things to get much faster and easier after reaching Hector and the main Southern Crossing trench back to Alpha Hut, several of us were starting to wonder if we were likely to make it through the entire day. Optimists in the group were guessing we’d be at Alpha by 4.30pm, but pessimists were picking more in the region of 6pm and becoming concerned about whether it was worth it. After some brief negotiations, we very quickly reached a happy consensus that we’d be better off not continuing with the original plan, and at 11.15am we decided to turn around and go back. Exactly where we’d go back to was yet to be determined, but there were several options. Shortly afterwards, we went back to the lower part of the slope on the western side of Neill for some lunch on the slope. We were still in a wafty mist at times, but the Sun was slowly beginning to emerge by now. Everyone was away again a bit after 12, when we kept going back up to the top of Neill, now going more slowly because there was probably a little less enthusiasm. The rainbow was now to our right and occasionally behind us, and it really stood out. We spent about 30 minutes walking and standing on the tops around Neill before dropping back into Neill Saddle, and with a bit more time to enjoy the relatively lazy walk it wasn’t until 2.30pm that we were back on Cone, and sat down in what was now becoming warmer sunshine. where we would have been. By this point, we were think we might just go down to Cone Hut, and try to beat out the other club group if necessary, so they wouldn’t re-locate our van to the far end of Marchant Ridge. 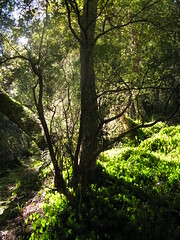 Another possibility had been to go direct to Totara Flats, where they should be staying the night, but we didn’t know for certain that they’d be there anyway. So Alistair had a go at phoning Craig (in the other group) to pass on the message that we were going to Cone, and was fortunate enough to be able to talk to him directly. It seems there’s work-able reception both on Cone Peak, and at least along parts of Cone Ridge, where they were. So now it was just a task of getting down to Cone Hut. We left Cone at about 2.50pm, and arrived back at Cone Saddle at around 4.20pm, hearing more Kaka squalking on the way down. After a brief sit-down at the saddle, we finally reached Cone Hut at 4.50pm. Alistair and Bernie got started on building a fire and although we had some damp-wood issues at first, it wasn’t long before the place was warming up. 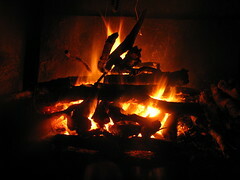 We settled into dinner, and soon after went to bed with the roaring of the Tauherenikau River outside. It did come up as a topic of conversation that we were having a much better time roasting in Cone Hut after a relaxing day than we might have been having in an Alpha Hut freezer after an exhausting day. Everyone slept in on Sunday, and lazed around until well after 10am, which seemed a bit unusual for what the trampey club had rated a fit trip. There wasn’t much incentive to leave early, considering that Craig had told us the other group wasn’t likely to reach the road-end any earlier than 2pm. We were literally about 1.5 hours away. Previously a few of us had been thinking about the possibility of walking out via Tutuwai Hut while the others went out the other way to get the van. This never eventuated, though, since in the end we couldn’t be bothered and were having too good-a-time socialising, or something like that. We did finally leave at 10.30am, though, with a plan to continue very casually and to find a nice place for lunch on the way down, in what was now bright sunshine. After about an hour, we found such a place just off the track, and stopped for a very leisurely lunch and gossip session (which is completely normal on any trampey trip). As we munched and chatted, a group of 6 or 7 people from what looked like another tramping club walked past us up the hill, on what they said was some kind of circuit daywalk. These were the first people we’d seen since waving goodbye to the people of the other trip on Friday night. We got up and left again at 12.15pm, and roughly an hour later we were back at the van. This was excellent timing because during the 20 minute window that it took for everyone in our group to reach the bridge over the Waiohine Gorge, all 9 people from the other club trip turned up having arrived from Totara Flats… so we didn’t even have to wait long to get back into our van. In the end it was a really worthwhile trip, as most trips are. Among other things, I got to see a Tararua kaka in the wild. We didn’t get to go to where we originally planned, but I think it says something about the people you’re out with when everyone can reach a quick and easy consensus to give up without any dissent. We had a great time. 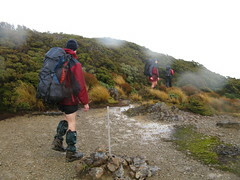 This entry was posted in tramping and tagged bagged:cone hut, change of plans, rain, tararuas, tramping, wellington tramping and mountaineering club. Bookmark the permalink. We’re looking for a fly to use as emergency shelter. Where did you get yours? Happy with it? We’ve been using Huntech fly’s. Huntech calls them “Two Man Bivvy” but as I mentioned it’s usually easy enough to get three people under them, unless they’re extra big people I guess. There’s a helpful trick which involves clipping the tension strap between the two ends of the pole to a different place from what’s suggested, and that makes it a little wider at the expense of a small amount of height. They’re a fairly basic open-ended tent fly, which weighs about 1.2 kg (from memory) so it’s not overkill if you’re just after shelter for below the bush-line. The tramping club loans them out to members but a lot of us have our own ones. If you have a walking pole you can use it to prop up one end, but it’s not really necessary if there’s a handy tree-branch to tie it to. Specifications are available on Huntech’s website. Huntech is based in Upper Hutt and they sell them for $275 each, but there’s a place in Carterton that’ll post you one via mail order for $252. It’s probably not worth bothering with the Bivvy Floor. I bought one for an extra $32 to see what it was like, but I’ve never used it because it’s quite heavy and I think you’re usually better off with your own groundsheet. You’ll probably also want to buy at least 5 decent pegs if you don’t already have some. The pegs they supply with the fly are hopeless. I think I destroyed or lost 3 of mine the first time I put it up in the wind, but I didn’t really buy it for the pegs so that was okay. If you want to take a look at one then flick me an email and I’ll loan you mine. I don’t think I’m going to need it for at least a couple of weeks. Oh, and I forgot to mention that yes they’re fantastic!